By the middle of the 20th century electicity had been available for so many years most people took it for granted. Did you know that in 1949 there were still rural areas where people did without electricity? An article in "�The Brampton Conservator� newspaper on March 17, 1949 provided the following information. "Schools in the highly populated areas of Peel County are overcrowded and basement rooms, being used for classes, are �unsuitable�, stated a report by Dr. Donald G. MacDonald of the county health unit to County Council. Dr. MacDonald reported the rapid increase in the population has made a school building program necessary. Three schools in West Chinguacousy township had unsatisfactory wells. Through recommendations of the health unit these were corrected, the report said. Natural lighting in many of our one-room schools is poor. Eleven of the 61 one-room schools in the county are still without artificial lighting. Twenty-four had drinking water which did not test class A1 on its first test. Fifty-one have stoves in the classroom." How much do you know about The Old Britannia Schoolhouse? Here are some trivia questions to try. 1. What flag would have been flying at The Old Britannia Schoolhouse in the year 1900? 2.	Who was the Queen in the year 1900? 3. How many grades were there in The Old Britannia Schoolhouse in 1900? 4. 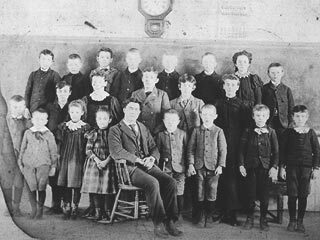 Approximately how many students attended the schoolhouse in 1900? 5. What did children wear to school in 1900? 1. The Union Jack would have been flying at the schoolhouse. It combines the St. Andrew�s Cross of Scotland, the St. George�s Cross of England and the Irish St. Patrick�s Cross. The Union Jack is still flown outside the schoolhouse today. 2. Queen Victoria was Queen of the British Empire which included Canada. 3. There were 8 grades in The Old Britannia Schoolhouse. There was no kindergarten. 4. There were 25 or 30 students in 1900. 5. Girls would have worn mid-calf length dresses with a petticoat underneath, a pinafore over top and wool or cotton stockings. Boys would have worn knickerbockers with knee length socks, braces (suspenders), a shirt and often a tie. Some might wear overalls and a shirt. Both boys and girls wore boots with laces. In the good weather both boys and girls sometimes came to school barefoot. Here are two photos of children showing the kind of clothes they wore. The first picture is of the 1885 class of students at The Old Britannia Schoolhouse. It must have been a special occasion, perhaps the annual Christmas Concert, since everyone is dressed in their finest attire with the boys in suits. 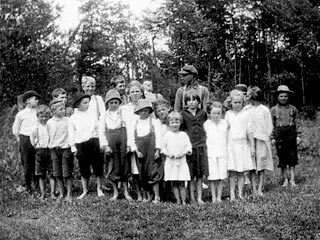 The second photo is a class of students in a rural school in Muskoka about 1917. You can see that the clothes are much less fancy and everyone is barefoot. Boys clothing would have changed very little between 1885 and 1917. The girl�s clothing would have become less fussy and the pinafore would no longer be worn.